Young African woman in casual clothing relaxing in outside comfortable armchair and enjoying sunlight with eyes closed. Relaxed comfortable Caucasian freelance worker texting on smartphone messenger app enjoying comfortable train ride. 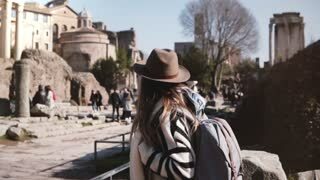 Young casual relaxed female tourist with backpack in stylish clothes walking at the Rome Forum enjoying the scenery. 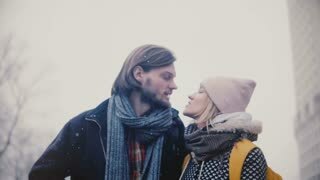 Happy relaxed young romantic couple in casual warm clothes walk together, hug and kiss on a snowy winter Christmas day. Back view happy relaxed Caucasian young romantic couple in casual winter clothes walk together hugging on a snowy day.